In an empire of warriors and vengeance, the T-4 is considered one of the most dangerous and effective assault platforms in any space navy. Designed to fulfill multiple combat roles, the T-4 is at once a full scale lander, troop support and base establishment platform while retaining an effective offensive capability rarely seen even in the Empire. The T-4 went through a significant number of changes over the years before tooling was finally begun. The T-4 is based heavily on the L-4 frigate, which itself proved surprisingly effective. As designers and planners hashed out the needed requirements and duties of the T-4, the vessel quickly became a focal point for house infighting and political brinkmanship. The second round of designs saw the T-4 transform from an orbital support platform to a landing vessel. This change would produce one of the largest land-able Klingon starships ever. The T-4’s ground support capability was unprecedented. With six separate landing ramps, the T-4 could open multiple access-points and deploy ground effect vehicles, tanks and support vessels as well as numerous troops directly onto the field of battle. Special transporter support systems allowed the T-4 to beam significant numbers of troops through jamming that would otherwise prevent major landings. No less than thirty specially modified medium atmospheric disruptors could easily lay down fire to cover disembarking troops. While useless in ship-to-ship combat, these heavy guns were further supplemented by 20 projectile cannons capable of firing over the horizon. The primary shields were also heavily modified with supplemental systems that would allow the ship to generate an effective ground shield nearly 100 meters from the main hull. This effectively turned the T-4 into a ground fortress with the T-4’s supplemental ship-to-ship weapons used to attack orbiting targets when needed. A large command-and-control center for ground operations was also installed, as were three separate medical facilities. 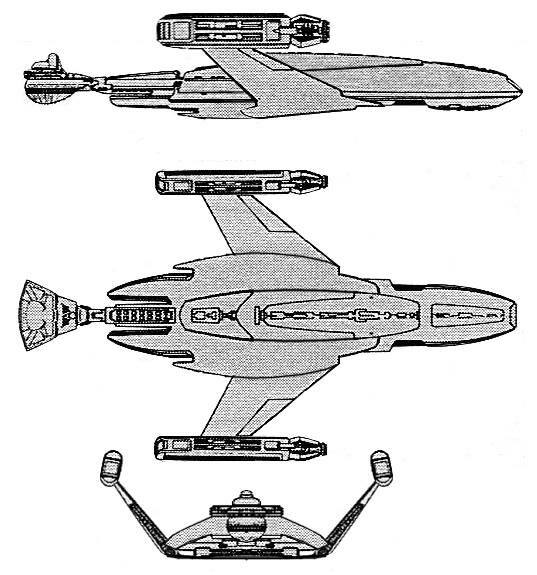 As a combat starship, the T-4 was effective against light craft and, when properly escorted, could defend its self against larger destroyers and cruisers for short periods of time. When fully loaded, the T-4 was considered vulnerable, but could still maintain effective warp speed to ensure the forward movement of any war-front. While the T-4’s abilities were impressive, even to this day, the design was staggeringly expensive when compared to other assault ships. The specialized transporters and shield modifications were twenty times the cost of standard systems. The repulsor generators used to land and take off from a planet surface were considered so exorbitant that some considered cancelling the T-4 after the first vessel was finished. In 2249, all doubt of the T-4 was eliminated when four “Earthquakes” were send to attack a Romulan mining planet. A squadron of D-4’s engaged the defending Romulan cruisers while the T-4’s commenced landing operations. Once on the ground, the T-4’s disembarked their entire combat force and spend the next 37 hours beaming troops to and from the surface, continually attacking the largest of the mining outposts. Only when reinforcements were detected did the T-4’s pull their troops from the surface. Even as they departed the system, the T-4’s engaged the vanguard of the Romulan reinforcements, effectively destroying several lighter craft. During the Four-Years War, however, the T-4’s major flaws became apparent. The T-3, the contemporary of the T-4, was significantly cheaper to build and had nearly the same in-field operational costs as the T-4 despite having nearly double the embarked troops. Field commanders quickly learned that the T-4’s battle-cruiser like firepower could not protect the vessel when fully loaded. The T-4’s sluggish response in ship-to-ship combat quickly evened out any tactical advantage from its weapon. By wars end, the T-4 had fared better than the T-3 and T-8, but had still not been able to stem the tide of the Federation. The launch of a B model in 2257 was the eventual death-knell of the T-4. With firepower equaling a battleship, the T-4’s single purpose mission meant the vessel was useless as anything but a troop transport and support vessel. When fully unloaded, the T-4 surpassed many battlecruisers in sheer firepower, but was unable to fulfill any other mission. Used effectively against the Romulans and Kinshya, the T-4’s significant operating expenses finally forced the retirement of the class in 2277. A total of 147 T-4’s were fielded before production was halted in 2268. 13 A’s and 2 B’s have been destroyed; 4 As and 1 B have been scrapped. 2 A’s and 1 B have been captured by Star Fleet. 30 A’s and 40 B’s have been disarmed and sold to a wide range of clientele. 20 As and 20 B’s were traded to the Romulans during the technology exchange. 8 A’s and 4 B’s are in service to Ranking Families in the Empire. 2 B’s are listed as missing, one of which is known to operate with the IKS. 34 As were converted to B’s. The T-4 was produced at Quronos and Fonawl, where peak construction rates reached 10 per year. Power Units Available – 11 ea. 11 ea.